I can’t blame you. There’s a lot of talk, hype and misinformation out there about gluten these days. Some people think that gluten-free living is just a fad that will go the way of low-fat dieting, margarine, and leeches — and good riddens to you all! Others believe that gluten is the most evil of food-villians, and that going gluten-free is THE key to digestive health, weight management, and health utopia. To confuse things further, the researches who discovered non-celiac gluten sensitivity (NCGS, aka gluten intolerance) published a study in 2011 that says that non-celiac gluten sensitivity doesn’t really exist (more on this below.) Let’s look at the facts and get a handle on this subject. Because let’s face it, I don’t want to avoid gluten if I don’t have to and I know you don’t either. First of all…what in the world is gluten? If you ask my brother, he’ll tell you that, “it’s the stuff that makes food taste good.” And indeed, it is an ingredient that adds thickness, texture, and let’s face it, taste, to our favorite foods: pizza, breads, pastas, baked goods, pastries, and beer. It’s also commonly hidden in non-bread-like foods like salad dressings, soups, energy bars, and even in some vitamins and medications. 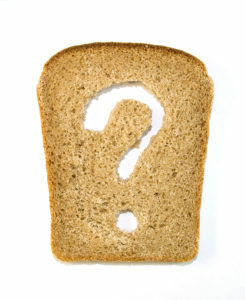 Gluten is the complex protein found in wheat (including whole grain wheat, spelt, wheat bran,) rye, and barley. Almost all oats contain gluten due to cross-contamination, and some studies and laboratory tests suggest that the gluten-like characteristics in oats, corn, rice, and even some unlikely foods such as coffee and chocolate, could mimic the properties of gluten in some people, a process known as cross-reactivity. Is gluten intolerance the same thing as celiac disease? No, it’s not. Most people have heard the term “gluten” in conjunction with celiac disease, a hereditary (meaning someone else in your bloodline has it) autoimmune (meaning that your immune system is attacking your own body like it’s public enemy number one) disease that specifically causes damage to the small intestines. The most common symptoms of celiac disease are digestion disturbances (stomach pain, bloating, diarrhea, constipation, etc.,) but it can affect other areas as well and cause symptoms as vague as headaches, fatigue, and joint pain. Some people may have only minor symptoms or no symptoms at all. Long-term celiac disease can lead to intestinal cancer, severe malabsorption that results in anemia, osteoporosis, muscle wasting, and other autoimmune diseases that then begin to destroy the cells of the skin, brain, or other organs. Celiac disease is nothing to mess around with. You can be screened for celiac disease by a simple blood test called Tissue Transglutaminase Antibodies (tTG-IgA). This test will be positive in about 98% of patients with celiac disease who are eating a diet containing gluten. There are a few other tests that your doctor can order to make the diagnosis in the 2% that the tTG-IgA test doesn’t catch, and intestinal biopsy is still considered the gold standard to diagnose celiac disease. But the tTG-IgA test is the best place to start. Even though celiac disease affects less than 1% of the population, you should absolutely have the tTG-IgA test run if you have frequent or recurring digestion disturbances or if you have celiac disease in your family history. But let’s say you’ve had this test run and it shows that it’s highly unlikely that you have celiac disease. Congratulations! But don’t reach for that sourdough baguette just yet. There are a couple of other things you need to know about gluten first. A new villain on the scene. Back in 2011, there was a double-blinded, randomized, placebo-controlled study that found gluten could cause gastrointestinal symptoms in patients without celiac disease. This gave major credibility to the idea that even if you don’t have celiac disease, gluten is still the likely villain that is causing your tummy to hurt, and also led to the upswing in the gluten-free food business. The research team then decided to reproduce the study with a few changes, and the new study published in 2013 in the journal Gastroenterology found that gluten probably wasn’t the culprit after all. This study tagged a new villain, and it goes by the acronym FODMAPs. FODMAPs stands for fermentable oligo-di-monosaccharides and polyols, and what you need to know if your tummy is frequently unhappy is that you may have a problem digesting these carbohydrates. FODMAPs are found in wheat, garlic, artichokes, dairy products, and some fruits and legumes. Most people can digest them just fine, but for those with chronic digestive issues such as IBS (Irritable Bowel Syndrome, which affects about 20% of Americans,),FODMAPs can become fermented and produce gas, leading to a host of other symptoms. If you suffer from chronic digestive disorders, give a low FODMAP diet a try. And then I would urge you to continue to work with a doctor to find the true cause of your illness. Many digestive disorders, including IBS have an underlying cause of INFLAMMATION along with MICROBIAL IMBALANCE, and these causes can be targeted and treated. You should also notice that even though gluten might not be as big of a culprit for causing stomach symptoms in those who don’t have celiac disease, wheat still contains FODMAPs. So put the baguette down. What if I don’t suffer from stomach problems? I’m off the hook right? Not necessarily. Gluten is still considered pro-inflammatory. This means that it has the propensity to cause inflammation in most people. Inflammation is the cause or major contributor to every disease known to mankind. In addition, gluten is linked to a host of autoimmune diseases. It especially has a propensity to affect the thyroid (as in Hashimoto’s Thyroiditis) and the brain, affecting conditions such as Parkinson’s, Lou-Gherig’s, chronic vertigo, and many other neurological diseases. Gluten has also been known to affect the pancreas in ways that can lead to adult-onset diabetes, and the skin and mucosal membranes, causing allergies and chronic skin irritations. If you have been diagnosed with any of these diseases I would urge you to go gluten-free NOW. My colleagues and I can personally attest to the remarkable recovery of many, many patients who had severe illnesses, after adhering to a strict gluten-free diet. Which begs the question…wouldn’t it be good to know IN ADVANCE if gluten is accelerating an autoimmune response in your body BEFORE you are diagnosed with a formidable and deadly disease that stole your life away? What if you could take a PROACTIVE stance and do an easy blood test to see if gluten is indeed a friend or foe for you personally? What if you could know for sure? Thankfully the science behind functional lab testing is catching up with our ailments. There is an easy way to know if you should avoid gluten like the plague or if you can chomp merrily away on your favorite foods, and it’s done by a simple blood test. Cyrex Labs offers the most comprehensive look at your immune system’s reaction to gluten, and can also test for the cross-reactivity response from other foods so that you can know for sure if you should stay away from it or if you can pick up that baguette and enjoy it without consequences (at least from the gluten it contains). This test must be ordered by a doctor, but it can be performed in just about any part of the country. For more information, contact me directly. Can’t I just eliminate it for a few weeks and see if I get better? Removing gluten from your diet for a period of time and then adding it back in is called a “challenge test” or “elimination diet”. While there is some merit to this method, and it certainly won’t hurt you, please realize that it is NOT conclusive for a couple of reasons. Elimination diets are difficult to accomplish because of all the different sources of gluten and cross-contamination. Also, it could take months, or in some cases years, for the symptoms you are experiencing to completely go away, so doing a challenge test for a couple of weeks won’t necessarily give you enough time to get the information you are looking for. Autoimmune symptoms tend to wax and wane anyway, and there could be hours or days between the trigger and the symptoms. So the best thing to do is the conclusive test. I love being healthy and I love being proactive about my health. And while I’m not perfect, I do my best to practice what I preach — especially now that I’m older and wiser…and a mom! I don’t have any type of chronic digestive disorder or symptoms that would have led me to believe that I could be gluten-intolerant. But as a functional neurologist, I frequently research and study about nervous system diseases, thyroid disorders, and autoimmunity, and I have treated some patients who have suffered with very severe illnesses. The ones that could have been prevented if they had the opportunity to make proactive choices made the most impact on me. What if they could have known? Would they have chosen to change their diet five or ten years earlier if they could have prevented the suffering they were enduring in the present? I know that in addition to injuries and extreme stress, autoimmune conditions can be triggered by hormonal surges and swings, such as during puberty, pregnancy, and menopause (which is one of the reasons why autoimmune conditions are so much more prevalent among women than men.) So when I got pregnant at the age of 39, I decided it was time for me to get tested for gluten intolerance. And lo and behold, even though I never had an outward symptom related to ingesting gluten, my immune system was certainly reacting to it. I did the cross-reactivity test too and found out that my immune system reacts to dairy as well. Because of these test results, I am gluten-free and dairy-free, and I’m confident I am preventing some nasty future consequences. I do, very occasionally, “cheat” and have a treat (and also take supplements to minimize the inflammatory and immune effects when I do). And I still never have any symptoms when I occasionally have gluten…although maybe it would make it easier to stay completely away from these foods if I did have symptoms. But what brings peace to my mind is knowing what I am preventing, and that I’m not robbing from my future to have a quick endorphin fix in the present. For me, it was testing that made the difference. If I didn’t know for sure, I would still be chowing down on my baguettes, and be eating my way into a world of hurt and who-knows-what kind of chronic disease. Knowing the test results makes it easier to do what’s best for my body and brain, and many of my patients say the same thing. I’d love to hear some comments from those of you whose symptoms decreased radically when you went gluten-free, or had different results, so post away! And contact me when you are ready to do the test! CHRONIC INFLAMMATION is Public Enemy Number One. Diseases that cause the highest death rates, such as heart disease, cancer, diabetes, and conditions affecting the lungs, kidneys, and liver, along with the ongoing ailments that folks suffer from day-in and day-out — headaches, arthritis, digestive disorders, dementia, nerve and muscle degeneration, and skin diseases, to name a few — are linked to chronic inflammation. When the immune system is overtaxed and asked to put out fires that are constantly raging, or if there are fires on too many fronts, it can lead to delayed healing, pain and suffering, permanent tissue damage, and death. So it behooves us all to find the root of chronic inflammation in our own bodies, and squelch it at its source (instead of merely covering up the symptoms with prescription and over-the-counter medications). That’s right, your oral cavity. Each of the categories listed above deserve their own explanation, and we’ll get to those in other posts. But for this article we are going to focus on the mouth as a primary source of chronic inflammation. How can this be, you may ask? How has my mouth betrayed me? Or maybe the question should be, how have you betrayed your mouth? The mouth has a rich and dynamic blood supply, and the skin in and around the gums is very fragile. Your immune system can handle the occasional onslaught, but if you have chronic gum or periodontal disease (chronic inflammation,) the persistent bleeding provides quick and ready access for the pathogens to have direct entry into your blood stream, your arteries, and your heart. 1. Improve your dental hygiene. Brush twice a day and floss once a day. I recommend using a dental floss with tea tree oil, and rinsing your toothbrush with hydrogen peroxide before each time you brush. Tee tree oil is a natural antibacterial, and diluted with water it makes a great mouth wash and gargle. Hydrogen peroxide will kill the nasty germs that are lurking on your toothbrush. Another advantage: H2O2 whitens teeth. Consider ditching the store-bought toothpaste and brushing with food-grade hydrogen peroxide and baking soda. 2. Cut the sugar and sugary drinks. Streptococcus mutans is the name of the bacterium that causes dental cavities (caries). It’s the culprit that forms the plaque that attracts microorganisms to attach to the surface of your teeth and gums. And just in case you’re wondering, antibiotics can’t touch these bacterium because the biofilm (plaque) that forms on your teeth protects it, which is why antibiotics are ineffective for preventing and treating cavities. Guess what the S. mutans uses to make this biofilm…drum roll please…sucrose, a.k.a. sugar. Sugar also changes the pH of the biofilm, which causes a demineralization and breakdown in tooth enamel and underlying dentin. When you cut out sugar you starve S. mutans. Buh-bye cavities. Buh-bye inflammation. But here’s the real kicker for your ticker: S. mutans has also been implicated in heart disease. It is the most prevalent bacterial species found in the artery cell walls of patients who undergo cardiovascular surgeries, and S. mutans infection is a leading cause of endocarditis (heart valve inflammation). So the bacteria in your mouth, fed by sugar, goes directly into your blood stream via your inflamed, bloody gums, and causes your heart to become diseased. Cut the sugar, starve the bad bacteria, save your heart, and possibly your life. Another major step you can take to cut your risk of chronic inflammation and all its tentacles is to use an oral probiotic. You know by now that I am enamored with probiotics, or good bacteria, and all the great things they do for our bodies. Our bodies have more bacteria than cells by far, and if your good bacteria outnumber the bad, chances are you are healthy. • Fewer cavities, gum disease, halitosis (bad breath,) and scraping and drilling when they go to their dentists for their regular cleanings and check- ups. • Fewer sinus infections and other upper-respiratory infections. Bad bacteria can’t set up shop where good bacteria are prolific. The good bacteria also regulate the pH in the mouth and sinus cavities, and help to undo some of the damage from the acid that we come into contact with when we eat and drink during the day. • Less gastric reflux/heartburn/GERD, and decreased GI symptoms such as nausea. The good bacteria help to squelch the acidity and can give almost instantaneous relief. • Lower levels of C-Reactive Protein as measured by blood work. C-Reactive Protein is a major indicator of inflammation within the body. Decreased chronic inflammation can translate into less pain and discomfort, a healthy heart, clearer skin, a calm tummy, and better brain health. I’ll tell you what I do and what I recommend to my patients: get a box of Dr. Ohhira’s Probiotics, STAT from Your Supplements! If you’ve never taken them before, check with your nutritionist or functional medicine doctor, and start slowly. There are times that high dosing comes in handy, but talk to your doctor first. The maintenance dosage I recommend is 1 pill for every 50 pounds of body weight*. You’ll want to make sure you chew at least one of them, before bed, after you brush your teeth. For example, what I do personally is swallow two and chew one. If you are 200 pounds, your maintenance dosage is to swallow three and chew one each night before bed. *There’s an added benefit to consuming more probiotics the more weight you are carrying, because research has shown that good bacteria is associated with a healthy Body Mass Index (BMI). Taking the right probiotics can actually help you to lose weight. But that’s the subject of another blog. Until we meet again, keep the inflammation low and the probiotic count high, and be blessed, healthy and happy.